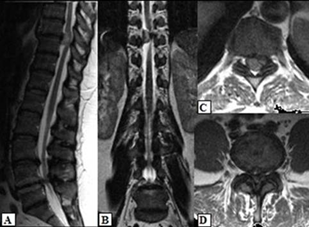 In this publication, we describe two cases of patients with a pronounced lumbar stenosis combined with tumors in the thoracic region, in which both lesions were diagnosed simultaneously. In world literature thus far, there have only been four cases of such a combination, and the compression in the thoracic region was discovered after the lumbar decompression and aggravation of neurological symptoms. Case №1. A 47 year old woman had suffered years of pain in the lower back and both legs. Following, a progressive weakness of the lower limbs, more pronounced in the left leg, began 20 days ago. She was admitted to the emergency unit of a local hospital with complaints of swelling, abdominal pain and constipation. The neurologist on duty established a weakness in her legs, more so in the left leg, and lively ligament-periosteal reflexes. A computed tomography (CT) of the L3-S1 levels showed a degenerative narrow canal at the L3-5 levels. For this reason the patient was transferred to the Department of Neurosurgery at the «St. George» University Hospital in Plovdiv, Bulgaria. The neurological status at the time of admission was presented by a pronounced lumbar vertebral syndrome, bilaterally (+) Lasègue, pain and numbness in the L5 and S1 dermatomes on the left, lower spastic paraparesis, more pronounced in the left leg (muscle power: L=2/5; R=4/5), lively knee but absent Achilles’ reflexes, and conduction hypoesthesia distally from Th12. There were no disturbances in the functions of the pelvic reservoirs established. Case №2. A retired lady of 62 years had years of low back and spine pain. During the last year, the pain had become constant, her legs had become numb and a weakness of both feet had appeared. Walking had become difficult and the use of a cane had become necessary several months ago. She had also begun to rest every 10 meters when walking. During the admission to the hospital, the status of the patient was presented by a vertebral syndrome of the thoracolumbar segment, hyperalgesia and hypoesthesia for dermatomes L4, L5 and S1 bilaterally, weakened knee and Achilles’ reflexes, peripheral paresis for nn.fibulares et tibiales, lower central paraparesis (Grade III) and conduction hypoesthesia for superficial sensation distal from the inguinal folds. She is married with two children and has high blood pressure. Two subsequent surgeries were performed for each of the patients. In the first patient, the first operation was a total extirpation of the tumor on the levels of Th9-10. The histological study found evidence of a psammoma body version of a meningioma. Ten days later, a bilateral decompression of the roots and cauda equina on the level of L4-5 was preformed. In the second patient, due to the significant pain syndrome and the peripheral paresis of nn. fibulares et tibiales, the decompression of the lumbar stenosis was performed first. After 10 days, a second surgery was carried out in which the 1.5-2 cm intradural tumor on the level of Th11-12 was removed. The histological result was a meningioma with calcium deposits. In the second patient, there was a significant reduction of the pain, the vertebral syndrome and the paresis of nn. fibulares et tibiales immediately after the first operation. A mild hypoesthesia in dermatomes L4-S1 persisted bilaterally. One month after the second operation, the central paresis decreased to McCormick Grade II. Meningiomas represent 25-46% of all primary spinal tumors. They are more common in women (3-4.2:1) of middle age (40-60 years), usually in the thoracic region (67%-84%) and the time of debut to diagnosis ranges from 1 to 2 years. [4, 9] They have a slow growth and the symptoms depend on the localization of the tumor in regards to the level of the spinal cord. The fact that the right-sided meningioma in the first patient led to a more severe paresis opposite in the left foot is an exception to the general rule, for which we found no analogue in literature. Literature reports on the coexistence of a clinically and diagnostic imaging expressed lumbar pathology (herniated disc and/or stenosis) and a meningioma in the thoracic area are extremely rare. [2, 10, 11, 14] (Table 1) In these cases, due to the untimely diagnosis of the tumor, a surgery in the lumbar area was performed, after which the neurological deficit worsened over a period of 6 to 120 days, which according to the authors, was due to the dynamic change of the cerebrospinal fluid flow after the decompressive surgery. [2, 10, 11, 14] In support of this statement was also the aggravation of the lower paraparesis in our first case after the lumbar puncture. Lesions in the thoracic region are relatively rare, a reason for the greater attention given to the much more frequent lumbar pathology and they are often missed. The undiagnosed thoracic lesion in patients with simultaneous compression of the spinal cord and cauda equina is due to the combination of symptoms of central lesion (spasticity and hyperreflexia), amongst the symptoms of peripheral damage to the nerve roots of cauda equina (pain, reduced ligament-periosteal reflexes and muscle hypotrophy). In the first of our cases, due to the long history, the deficit caused by the compression of medulla spinalis was more expressed. This made possible the determination of the lower spastic paraparesis and the sensory level during the examination, though they were veiled by the clinical symptoms of the lumbar stenosis. In order not to miss the presence of a lesion of the spinal cord, an examination of its functions is always necessary as well as an MRI, especially in cases when the lumbar CT cannot explain the clinical symptoms in a patient. Barnett GH, Hardy RW Jr, Little JR. etal. Thoracic spinal canal stenosis. J Neurosurg 1987;66:338–344. Bozkurt М., Göçmez C., Okçu M. et al. Paraplegia due to missed thoracic meningioma after lumbar spinal decompression surgery: A case report and review of the literature. Dicle Medical Journal 2014; 41(1):210-213. Fushimi К., Miyamoto К., Hioki А.et al. Neurological deterioration due to missedthoracic spinal stenosis after decompressivelumbar surgery.Bone Joint J2013;95-B:1388–1391. Gottfried О, Gluf W., Quinones-Hinojosa A. et al. Spinal meningiomas: surgical management and outcome. Neurosurg Focus, 2003;14(6):1-7. Harzallah L., Bouajina E., Ghannouchi M. et al. Low back pain and sciatica asthe presenting symptoms of neurinoma near the conusmedullaris. Contribution of magnetic resonance imaging. Joint Bone Spine 2005;72:187-9. Helseth A, Mork SJ: Primary intraspinal neoplasms in Norway,1955 to 1986. A population-based survey of 467 patients. JNeurosurg 1898;71:842–845. Hioki A, Miyamoto K, Hosoe H. et al.Two-stage decompression for combined epiconus and cauda equina syndrome due to multilevel spinal canal stenosis of the thoracolumbar spine: a case report. Arch Orthop Trauma Surg2008;128:955–958. Kim BS, Kim J, Koh HS, et al.Asymptomatic cervical or thoracic lesions in elderlypatients who have undergone decompressive lumbar surgery for stenosis. Asian Spine J 2010;4:65–70. King AT, Sharr MM, Gullan RW, et al: Spinal meningiomas: a 20-year review Br J Neurosurg 1998;12:521–526. Knafo S., Lonjon G., Vassal M. et al. Spinal cord compression due to undiagnosed thoracic meningioma following lumbar surgeryin an elderly patient: a case report. Orthopaedics& Traumatology: Surgery & Research,2013;99:983-986. Ko SB, Lee SW, Shim JH. Paraplegia due to missed thoracic meningioma afterlamino-tomy for lumbar spinal stenosis: report of two cases. Asian Spine J;2011;5:253–257. Shimada Y, Miyakoshi N, Kasukawa Y. etal. Clinical features of cauda equina tumors requiring surgical treatment. Tohoku J Exp Med 2006;209:1-6. Shin DA., Kim SH., Kim KN. et al. Spinal Cord Tumors of the Thoracolumbar JunctionRequiring Surgery: A Retrospective Review of ClinicalFeatures and Surgical Outcome. Yonsei Med J 2007;48(6):988-993. Takeuchi A, Miyamoto K, Hosoe H, Shimizu K. Thoracic paraplegia due to missed thoracic compressive lesions after lumbar spinal decompression surgery: report of three cases. J Neurosurg 2004;100 (Suppl Spine):71–74. 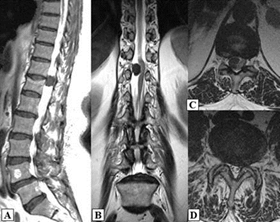 Tashiro K. Symptomatology of thoraco-lumbar junction lesions.Spine Spinal Cord (Tokyo) 19903:413-420. 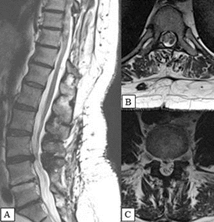 Valls PL, Naul LG, Kanter SL: Paraplegia after a routine lumbar laminectomy: report of a rare complication and successful management. Neurosurgery 1990;27:638–640. In literature, there are only several reports of a thoracic meningioma combined with a lumbar stenosis, in which the tumor was discovered after a lumbar decompression and aggravation of the neurological symptoms. We present two patients each with a thoracic meningioma in the region of epiconus medullaris (Th10-12) combined with a lumbar stenosis. The lesions were diagnosed at the same time, regardless of the atypical clinical presentation caused by the overlapping of symptoms of central and peripheral damage. Two surgeries were performed for each of the two patients within two weeks of diagnosis, where the lesion defining the clinical symptoms was operated first. In cases of a lumbar stenosis, as not to miss a thoracic lesion, it is always necessary to carry out a complete clinical examination of the spinal functions prior to surgery. A magnetic resonance imaging (MRI) study is required when the computed tomography (CT) study is inconclusive.